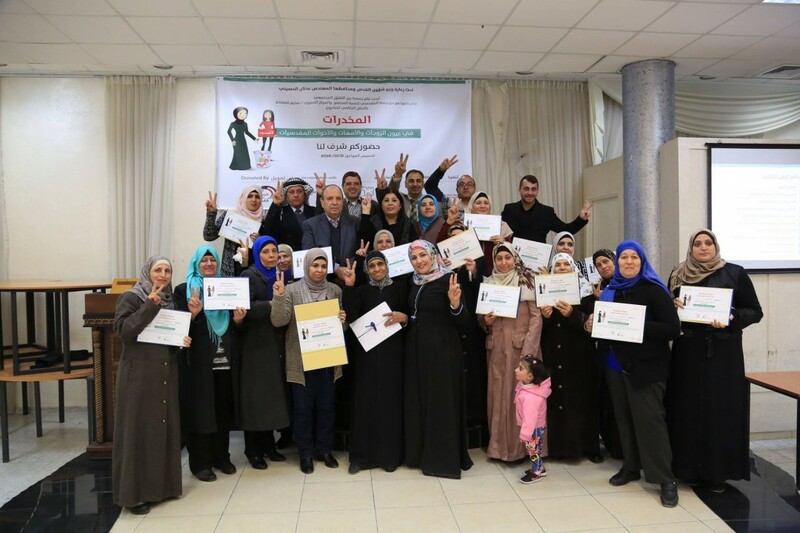 Burj Al-Luqluq Social Center Society organized a closing ceremony for the Drugs in the Eyes of Jerusalemite Mothers and Sisters project, on Thursday 08/12/2016 in the Women Center in Shu’fat, with the participation of 60 male and female participants. The event was organized under the supervision of the Jerusalem Governor, Adnan Al-Husseini, Mr. Hamdi Al-Rajabi from the Supreme Jerusalem Committee to Combat Drugs, Mr. Issam Jweihan from Al-Maqdese for Society Development, Jihad Abu Zneid from the Women Center, in addition to Muntaser Edkaidek and Nader Al-Sabbagh from Burj Al-Luqluq and the Educational Supervisor Samir Al-Turman. It is worth mentioning that this projects is executed by Burj Al-Luqluq, funded by Kuwaitis for Jerusalem Committee in cooperation with Al-Maqdese for Society Development and the Women Center in Shu’fat.